An overview of the main landing. There's a save game point and a green ball which restores your health here if you need it. From now on, whenever you step into a time gate, it'll send you to the end of time, which will connect all the time gates you've accessed so far. If it's your first time going through a time gate however, you'll travel to the destination, but going into the gate from that point onward will send you to the End of Time. For example, the gate at the millennial fair in 1000 A.D. connects you to a gate in a mountain range in 600 A.D., although neither gate is accessible from the end of time yet. The first time you step into the gate at the millennial fair you'll end up in 600 A.D., but entering that gate from any point onwards will send you to the End of Time. While you're in the End of Time you can travel through to any gate you've accessed so far and save/restore health, it's essentially a time travel hub which makes things easier for you. The End of Time is also where you can switch between party members. If you talk to a character and say yes when they ask if they can join you, the background music will switch to their theme song. You can also switch characters at any point in the game just by pressing . In the DS version, you can also go to Arena of the Ages and train your monster or let it fight to receive prizes. 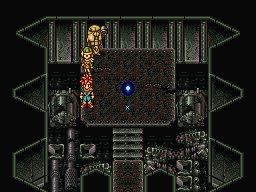 You'll want to take each character to meet Spekkio, although technically only Marle, Lucca, Crono and Frog can actually learn any magic from him. When you first visit him you'll need to talk to him and walk around his room clockwise three times starting from the door, making sure you touch each corner, to learn magic. After that you can fight him for sets of Tabs, Ethers, and Elixirs depending upon what level the lead character of your party is at. He has one form only from levels 1 to 9 that most gamers probably won't see, and one form at level **/99 that gives out insane prizes after an insane battle. He'll only give out one set of prizes per form you defeat, so check out his page and try to get them all. At the moment there are three exits from the End of Time. The Dome in 2300 A.D. where you entered, a canyon 65 Million B.C., and Medina Village in 1000 A.D. Eventually you'll want to go to Medina, but now that you can switch characters at will through the end of time and actually learn magic, you might as well strengthen your party by doing some backtracking through 2300 A.D., you'll need to complete this section of the game later anyways and it can help build levels and better equip your party at this point in the game (if you choose to postpone this section of the game, the enemies will be much easier, but the equipment may not be as useful). For future references, this section should be ignored when referring to the "second trip" to 2300 A.D.. Grab the Power Tab after returning from the End of Time. As mentioned before, new portals open up in the end of time for every gate you travel through. You start out with three portals, but you've been through two other time gates you can't access yet. Specifically, the one at the Millennial Fair which took you to 600 A.D., and the one in Guardia forest which took you to the Bangor dome in the future. If you travel through either of those gates once you'll be able to travel to either side whenever you want. Eventually you'll want to head back to the millennial fair, but for now let's backtrack through 2300 A.D. so you can open the portal to Guardia forest and the other dome. 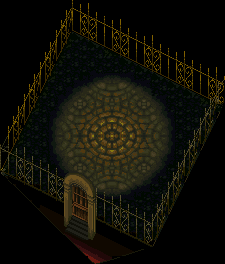 Take the portal back to the Proto Dome and check around near the Gate for a Power Tab and head back to Lab 32. If you haven't done so already, just walk across the highway area, fight some mutants, and pick up the race log so you can record your scores and race for a 1500 score to win a Power Tab. Once you've done that, you might as well take a detour to clear out the sewers. The monsters there are about on your level now and will seem like a waste later on in the game. You could have fought them earlier as well, but you needed to backtrack anyway and at least now you can switch characters and learn magic. The first area is pretty simple, fight a couple monsters and pick up a chest. The gimmick in the next area is that the monsters will attack if they hear the slightest noise, according to the diary. Simply avoid interacting with any of the objects and you can skip all the fights, or knock them all over if you're a glutton for punishment. Head into the next area and make your way through, making sure to pick up the rage band. It will give whoever equips it a 50% counter-attack rate, which is very helpful for increasing the number of attacks you do in a typical battle. Right after you get the rage band you'll fight Sir Krawlie, who's laughably easy. He'll knock some of your characters around and drain their HP to 1, just have Marle or someone heal and keep attacking him with magic. Make sure you flip the switch to open a bridge so you can get through the sewers easily later. 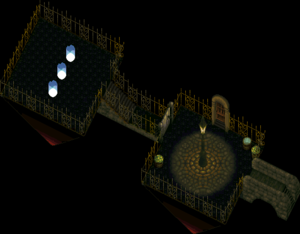 Once you're through you can visit Death Peak or check out the Keeper Dome and Balthasar, but there's not much you can do here yet, head back through the sewers using your newly created shortcut. After that, head back through Lab 16, trying not to have too many tonics stolen from you along the way, and go back to the Bangor Dome to open up two new portals at the end of time. The one to Guardia forest is still a dead end since the soldiers will cut you off, but it'll give you a sealed chest you won't be able to get anywhere else, and the Bangor Dome portal at least provides a shortcut for later. The only way you have to challenge Lavos at the moment is to take the bucket leading to 1999 A.D. You'll have to fight through all of his forms with only the four party members you have available. Your reward for beating him at this awkward stage of the game will be The Nu Ending, which is basically just a bunch of random sprites playing around while the credits roll. This page has been accessed 107,833 times.